With Premier Fishing Tips, You Will Catch More and Bigger Fish! Do you need fishing tips to catch far more big fish, much more frequently? Do you want to possess the best fishing information in the world? Do you want to be the premier fisherman in your area, with everyone wondering how you catch those fabulously loaded stringers? I'm guessing you answered "yes" to at least one of those. Authoritative fishing books: Ensure your success by building a personal library full of valuable fishing tips! 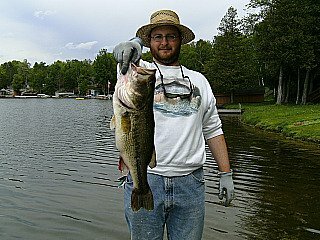 Very Productive waters: Choose the perfect lake, river, or pond. Then fish its most likely spots! Premium local knowledge: current, reliable, insider information! Easy fish-cleaning methods: it doesn't have to be a miserable chore! Special Recipes: indulge your appetite with great-tasting, perfectly flavored fish! Online Publishing Opportunity: upload your photos and stories to this site, then send links to friends to impress them! They'll be asking you for premier fishing tips then! I'm a young man with a passion to understand, catch, and eat freshwater fish. I've been fishing on and off since I was three years old. Recently, I have become very serious about my sport. Every fish deserves to be caught. For the past 13 years, I've gone to mid-Michigan in the summer for two weeks. I've been able to use a lakeside cabin for these vacations. Locals currently regard me as one of the premier fishermen on that lake. Up there, I have a very responsible position: when a big fish is caught, I'm usually responsible! Michigan is where many of my greatest fishing memories have been made. You'll understand why as you explore and see pictures of my brother and me on this site's pages. We catch the fish that nobody else can find, leaving locals awestruck and mystified! Being the premier fisherman in your area takes considerable time and dedication. But I'm sure my site will make it far easier for you. Please take full advantage of all the site offers. It's been built with you in mind. Study the information carefully, get on the water often, and learn to be premier...because every fish deserves to be caught-by you!